Today was the start of “Gluten-Free April” and it was a success! Over the weekend I printed out several recipes (which I promise to share the good ones!) and placed them in a binder. I find that I am much more motivated when something is tangible and recipes saved on my computer is just not going to cut it for me. I then sectioned off the binder and place the “Meals for the Week” in the front of the binder. This will make it simple to make a grocery list each week and to stay on target. However, I decided to add more to “Gluten-Free April”. It seemed appropriate to make April Fool’s Day the first day of looking at today forward. Gastroparesis sometimes feels like a cruel April Fool’s joke so I thought that I should beat it at its own game. In addition to going Gluten-Free I have also resolved to: exercise (at least mildly) for 30 minutes 4 days per week, limit my coffee intake to no more than 10 cups per week, prepare everything for the work day the night before (lunch, iron clothes, etc), and go to bed by 10 pm. These are all realistic and achievable goals. Some will be harder than others but I really think that I can do this. I strongly feel that by setting these goals that it will help me stay in a positive state of mind about having Gastroparesis. It is EXTREMELY difficult to goal set with Gastroparesis because you never know when you are going to go down for the count. You never know when a flair will hit. However, I have decided to reclaim my life and stop living it in fear! Throughout my life I have always been a goal-setter. They were goals that stretched me but were achievable. I would always celebrate when I achieved a goal and it was motivation to keep moving forward. Once I become severely ill and received my Gastroparesis diagnosis, I felt like my life was sitting in park. I didn’t want to set goals because I knew they weren’t realistic due to this outside force called Gastroparesis. 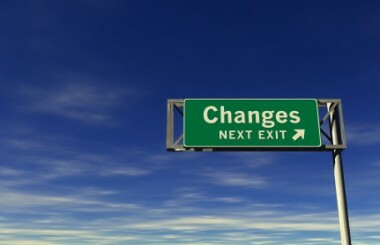 I learned years ago that goals should only be contingent on what you can control in your life. If you create goals around things that you can’t control you are only setting yourself up for failure. This is why I quit setting goals when I found out about Gastroparesis. Over the past weekend, I realized that goals were what was missing from my life. By typing my blog about “Gluten-Free April”, I received such a jolt of excitement and energy that I hadn’t felt in a long time. It stirred up more emotions in me than I thought were going to happen. It made me realize that I could still set goals, they would just be a different type of goal. I can say that I am 1,000% committed to reclaiming as much as my life as possible. I refuse to let Gastroparesis get the best of me and I refuse to let it have more of my days than I do. I will figure out a system that works and shifts with the target. I am on a mission, so GP better watch out because April is going to be MY month! You would be absolutely amazed at how many times I repeat this to myself throughout a day, week, month, or year. When your battling so hard to just maintain, it is hard to keep your hopes and dreams alive. However, you MUST keep them alive. You can never give in to giving up. (At least this is how I feel.) When I go through periods of self doubt where I wonder if I can keep performing at a high level at work, where I wonder if I am making a difference with my advocacy work, where I wonder if I am pulling my weight at home, where I wonder if I spoil my dog enough, I stop…take a deep breath…and repeats the words of Stuart Smalley in my head. As cheesy as it may sound, I repeat them over and over in my head and then set a goal of something to accomplish for the day. I find that once I accomplish that one item, I end up on a roll and get a whole list of things done. It’s just that sometimes, accomplishing that one item is so incredibly difficult. Who would have thought that a cheeseball character from all these years ago would be what kicks my behind in gear?! 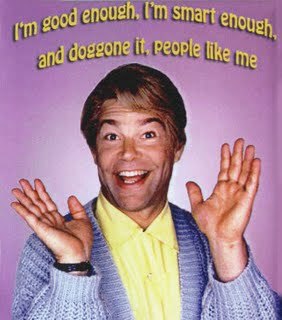 So this morning I added to my Stuart Smalley loop various comments I have received at work about my quality of work and my ability to maintain an extremely high standard while fighting with the moving target that is Gastroparesis. I repeat to myself that I have managed to successfully educate my workplace on Gastroparesis and how I have to live/work to balance it (which is an scaling Mount Everest type of fete for most people). I repeat to myself what my family/friends have said about what I continue to accomplish in spite of Gastroparesis. Most importantly, I repeat to myself several of the comments I have received about this blog from my fellow GPers. My little blog is making a difference and helping others. These are all reasons to crawl out of bed and accomplish some things today. I’m good enough! I’m smart enough! And doggone it, people like me! Gastroparesis is a tricky disorder. Not only does it affect your stomach, it also has a profound affect on your brain. As mentioned in previous blogs, I believe a reason for this is due to the malnourishment. However, I suspect that there is something larger going on. My hypothesis is that Gastroparesis also affects the chemicals in your brain. I’m not a medical researcher, I haven’t read anything on this subject, but I know how I felt when I had a concussion, I know how I felt prior to Gastroparesis, and I know what I feel like now. The only logical conclusion that I can come to is that in addition to the malnourishment that there is also a chemical affect. The worst instances of the pendulum is when it swings from hour to hour and your brain is literally all over the map. 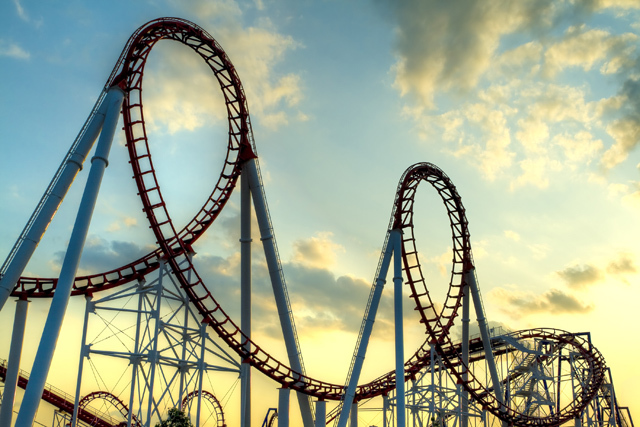 It’s like you are riding a roller coaster and the chemicals in your brain are dictated the course of the car. You have a surge of one chemical and you are flying high. You are happy, you are motivated, you come up with some truly amazing unique work. Then in the snap of the finger the chemical is gone and replaced with another one, you are then in a tunnel underground hoping that soon you will pop out on the other side. I try to keep my entries light-hearted and show how to remain positive through fighting Gastroparesis. However, I feel it is important to also educate about the dark side of Gastroparesis. When it gets dark, it gets REALLY dark. It is EXTREMELY important to remain positive so that when the darkness hits you can listen to that little voice in the back of your mind that is trying to break through and tell you that you can do it. Without that little voice, it would be hard to come out of the darkness. Now if I could just get off the roller coaster so that I can ride the antique cars with the GP Elves. It seems like it would be a much smoother ride with time to enjoy the scenery.